Text type: Hand written black paint. Detailing: Plain finials to cross beam, top finial is missing. Evidence of use in field: Pale yellowing to paint, slight decay of wood. 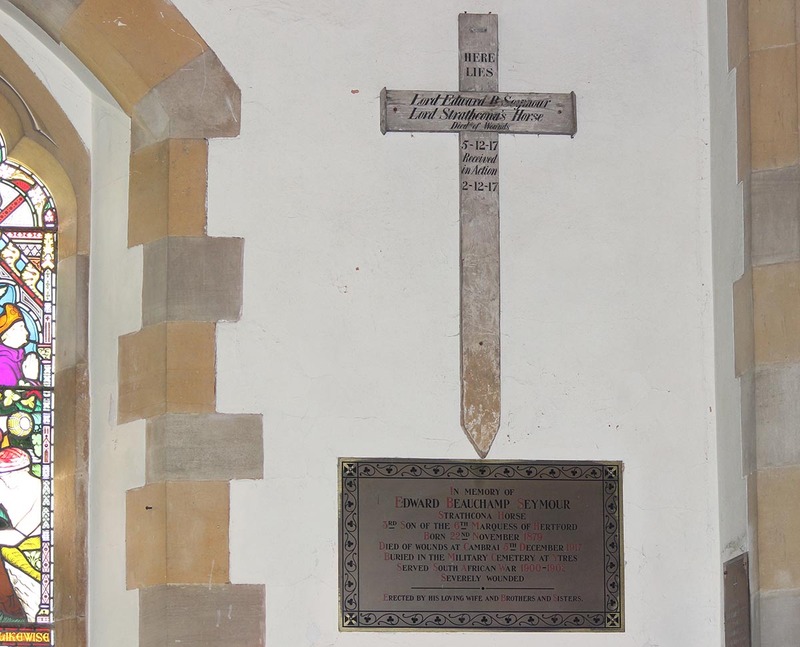 Brass memorial plaque mounted on wall below cross. Lord Edward Beauchamp Seymour, the 3rd son of the 6th Marquess of Hertford was born on 22nd November 1879 at Alcester, Warwickshire. On 12th February 1900 he enlisted as Private 370 Seymour, Edward, B., in Lord Strathcona’s Horse (Royal Canadians) at Calgary. He gives his trade as Rancher and is single, 5ft 9 1/4 in height and 153lbs. Surprisingly his medical record states poor muscular development, but he is otherwise fit and free from any serious illness or injury. LSH embarked for Africa in the South African War in March 1900, as part of the 3rd Mounted Brigade. On 1st October 1900 he was severely wounded in action at Krugersport. He served a total of 14 months with LSH and received the Queens Medal with clasps for Belfast and the Natal state clasp. In 1914 he married Elfrida de Trafford, the marriage registered at Kensington. 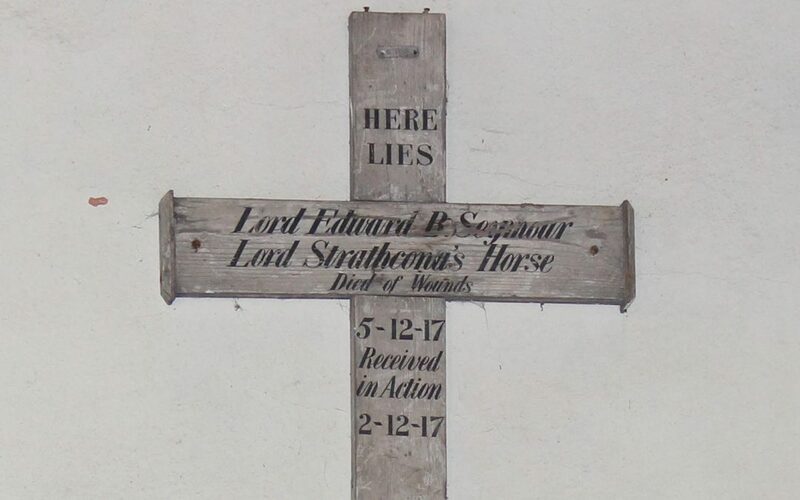 On 12th July 1916 he re-enlisted in Lord Strathcona’s Horse as Private 15646 Seymour Edward, B. In the attestation paper, he gives his previous military service as 14 months with LSH, with active service in South Africa and also from April 1915, 15 months with The Royal Warwickshire Regiment, including 3 months serving in France. No service record appears to survive for The Royal Warwicks and there is no trace of campaign medals for which he would be entitled. On 2nd December 1917 he was wounded at Cambrai and died of his wounds on 5th December.